Medicine Song is perfect driving music or for listening anywhere. Native American hand drumming/chant songs plus reggae/roots/soul songs infused with flute, guitar, bass, djembe and cajon by live world class musicians. Single “Woman” features Lillian Allen’s dub poetry over Native American drumming/chant. Spirit Connection includes 3 energizing songs at the beginning,breathing teachings and a short meditation in the middle, and it ends with a guided meditation for manifesting what you want, and a wordless meditative chant to sleep by. 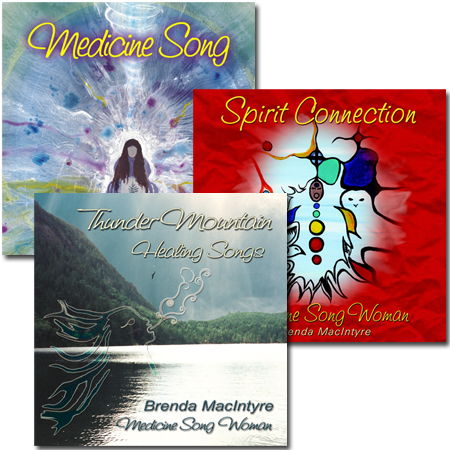 Thunder Mountain Healing Songs is very meditative and great if you want to learn women’s hand drumming songs or just learn to express your voice through song. Includes bonus indigenous electronica track to gently bring you out of meditation and re-energize you. The e-books include the lyrics and teachings for each song, as well as how to get the most out of the healing songs. Bonus spiritual law of attraction teachings from the recurring vision Brenda MacIntyre had at the age of 7.